Having spent time in the Arctic Circle in Lapland – where, with the sky filled in a flood of colour, the midnight sun shines for weeks, and the long polar night is brightened by the shining northern lights – the author was left with unforgettable memories. Thinking through these experiences led to this short but penetrating work, a study of the pathways and metamorphoses of light from a global perspective. The essence of light is to shine – it rays out dynamically in all directions at an unimaginable speed, never resting. The nature of matter, in contrast, is heavy, static and condensed. But matter can also let light through, as with crystal, or in the transparent and flowing element of water, evaporation and even air. Water and air thus act as ‘mercurial’ factors, allowing the creative potential of light to appear in a diversity of colours. The ‘deeds and sufferings of light’ are further to be found in many phenomena of the inorganic world such as the northern lights. By seeing the laws within phenomena, Goethe approached an understanding of the etheric formative forces. The object of this book is the observation of nature’s natural wonders using Goethe’s methodical process. 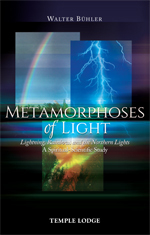 Apart from the rainbows, lightning and northern lights in the title, the author discusses the blue of the sky, the colours of twilight and the dewdrop, and halos and other light phenomena. The power of imagination produced by the observer creates depth and inwardness, says the author. In such a state of consciousness, one’s inner eye can picture ‘a threefold global union of light, which speaks to a threefold organization of the Earth’. Bühler’s concentrated work will inspire readers to make their own observations of the optical phenomena in our atmosphere, learning anew to treasure our planet for what it is – a human-scale home for which we are all responsible. DR WALTER BÜHLER (1913-1995) studied Medicine and Science. He was cofounder and director of the Paracelsus Hospital in Bad Liebenzell-Unterlengenhardt, and a board member of the Vereins für ein erweitertes Heilwesen (‘Association for an extended system of medicine’). He worked extensively as a teacher and lecturer, and was the author of numerous articles and several books, including Living With Your Body.